Last year, one of our hives swarmed 6 times. Each swarm involves dropping everything to capture and rehouse the wayward dames, none of which is easy to do with a full-time job. So this year, we split our hives the minute the nectar started flowing and they began to look crowded. This year, we hope to be sipping wine after work instead of chasing swarms all over Albuquerque’s SE Heights. You see drones in the hive (not capped, but actually walking around). And definitely if you see swarm cells. 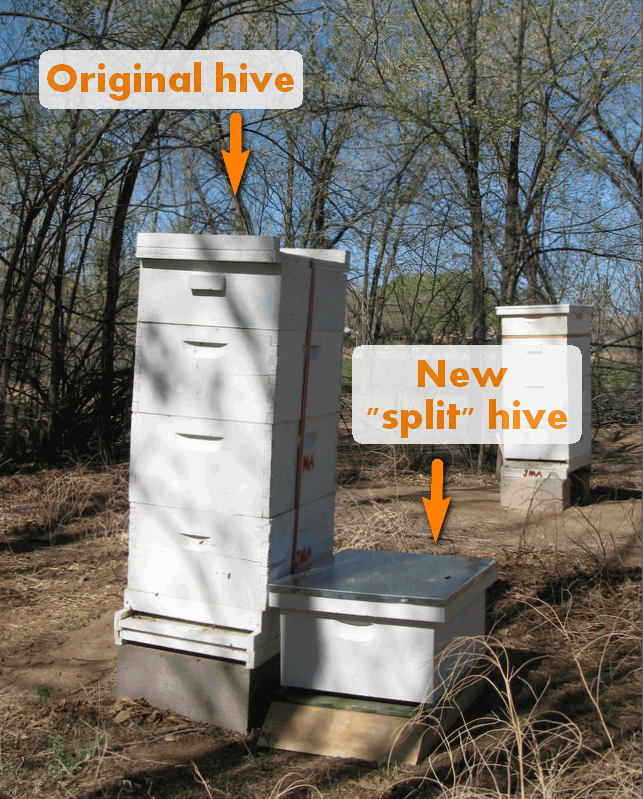 But splitting before you see swarm cells is OK too if you’re a risky sort of beekeeper. About two weeks ago, we followed the Bush Bees process for a walk-away split which involves far more wine-sipping then it does bee-checking, so I’m a hopeful believer. Only time will tell though, and we’re still a couple weeks away from knowing whether there’s a laying queen in both hives. UPDATE 5/20/2011: So it looks like 2 of our 3 “walkaway splits” were a success this year! Score one for lazy beekeeping.